SCAN reflects on the impact that the Spine works have had on Pizzetta Republic and The Deli. The ongoing Spine development has had a profound impact on campus businesses through the rerouting of student traffic away from the main Spine routes, with some stores seeing ‘significant’ downturns in business, however others remain optimistic about the future and believe that the new Spine will ‘benefit everyone’. The Design the Spine construction has been going on for over a year now, and its effects have been hard to ignore. 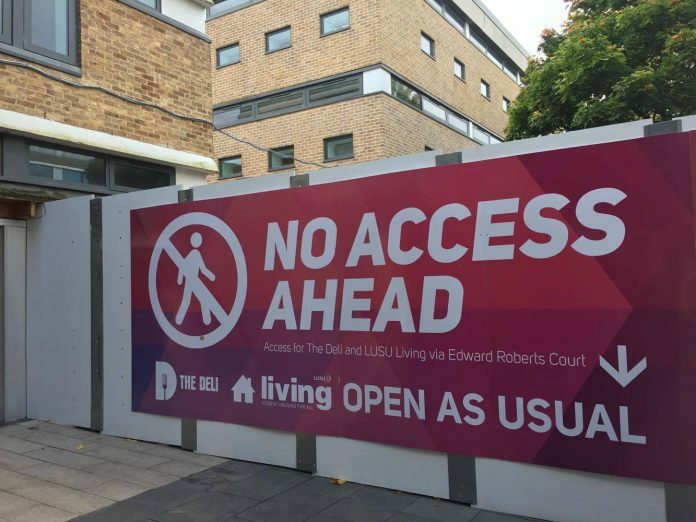 Just about everyone has been caught in the traffic jams at the north side of Alexandra Square and the stairs at Edward Roberts Court, while access to many of the campus stores has been largely restricted. This work is scheduled to be completed by spring 2018. Earlier this year SCAN covered the effect the work had on Pizzetta Republic, and I spoke to the owner Kamran Naderi once again to assess any changes which may have occurred as the Spine project moved forward. Nine months ago Mr Naderi claimed he had lost up to 70% of his business due to the disruptions, and while the front doors of his business are no longer blocked by the construction, the ‘majority’ of foot traffic is still diverted away from the store. For this year’s Freshers, the restrictive Spine development is all they’ve known, and this may have a long term impact in terms of which stores these students frequent. Edward Roberts Court has developed an identity as a food court of sorts, and as students get used to frequenting it for their lunch as opposed to other options away from the Court, this could result in a long term change in where students eat. It would seem then that there have been significant negative consequences that have arisen from the work, but it might not all be bad news. The newly refurbished courtyard outside Pizzetta is now open, with the addition of trees and soon a widened staircase. This improvement of what will be one of the busiest routes on campus could have a long term benefit on the business by making it a more appealing place to stop for passing students. Other businesses on campus are more optimistic about the future, and see the Construction as a temporary inconvenience which can be accounted for and will lead to an improved situation in the future. I spoke to the proprietor of The Deli, which has had a large portion of its entrance blocked off by building work, and he claimed that the effects of the work were not as bad as they may seem. In order to redirect students to the entrance to The Deli, signs have been put up in Edward Roberts Court which “make a big difference” in bringing in customers. Furthermore, while there has been a downturn in new customers compared to last year, this is expected to be temporary, as while new first-years may not frequent The Deli currently, it’s anticipated that the construction outside the premises will be done by February 2018, and once that happens more students will be aware of The Deli. Additionally a large portion of The Deli’s customers are students who frequented the store prior to the disruption as well as staff members, and the work has not deterred these customers. Surprisingly, The Deli saw a flow of customers who arrived for “construction tourism”; people who wanted to watch the work being done on the Spine as it progressed, acting in a small part to negate the loss in business from the reduction in passing students. While students have been redirected away from certain stores, the overall levels of business on campus have not gone down. A downturn seen by one establishment will be reflected by an uptick in another. In this sense the rerouting of student traffic cannot be seen as a negative for the campus economy as a whole, but instead a temporary change in where the majority of foot traffic passes by. In any case it is in the interests of everyone on campus to have a diverse range of establishments at which we can eat, and the Design the Spine project is not threatening that. Whether the overall effects of the development are positive or negative, it’s clear that it has had a major impact on campus life, for students and stores alike.